Secrets of the Steelpan - A Book Review by Hang-Maker Felix Rohner. Whether Felix Rohner would wish to be known as the “Father of HandPan” is debatable. He has, reportedly, shown a strong dislike for the “HandPan” moniker being applied to PANArt’s own creations - preferring them to be called purely, “Hang”. But as the inventor of the instrument type (along with Sabina Scharer), that is most commonly now known as “HandPan”, the title is fitting. So when Felix Rohner decides to publish a book review, anybody with more than a passing fascination with this instrument form, should find interest within it. Rohner begins the review with a nod to the work, “The Physics of Musical Instruments ”, by Thomas D. Rossing, and Neville H. Fletcher. Acknowledging its importance in both the creation of the Hang, and more recently, the Gubal. Before continuing on to discuss the book in question, “Secrets of the Steelpan ”. 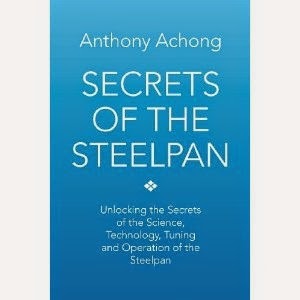 Secrets of the Steelpan, is a work by one, Dr. Anthony Achong, from Trinidad. Who, according to Felix Rohner, has spent a life-time, working with “sounding sheet metal”. * It has been noted by some, that Secrets of the Steelpan is quite a technical work. And could make for a challenging read, for those with little familiarity with the art-form.